The MBA House of Delegate chose a history-laden setting in which to tackle some very contemporary issues on the agenda for its November meeting. Against the backdrop of the Colonial-era Tavern at Old Sturbridge Village, the HOD dug into a full plate proposed resolutions, section council reports and association business topics. 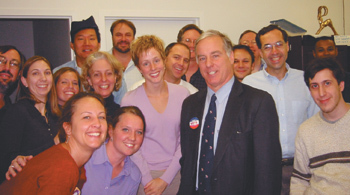 Attorney David Sullivan stands with Howard Dean and his staff, who worked in Ohio for the Democrats on voter protection. Sullivan is pictured third from right. For the 2004 presidential election, the Bay State had more representation at the polls across the country than just the Democratic nominee's name on the ballot. An army of lawyers from Massachusetts traveled to states across the country to make sure voters' rights to cast ballots would be protected. A man who served 16 years in jail after being wrongfully convicted of a crime and the lawyer responsible for overseeing the federal Sept. 11 victims' compensation effort will be the featured speakers at the Massachusetts Bar Association's Annual Conference 2005, set for March 3-5 at the Marriott Copley Place Hotel in Boston. Long-term care insurance: What is it? Who needs it?